One of my favorite features for customizing your YouTube channel is with a YouTube thumbnail image. Not only are YouTube custom thumbnails a great way to make your videos look more eye-catching to viewers, but they’re also great at generating leads from viewers from other videos which can help you not only gain more views and subscribers for your own channel, but most importantly, fill your funnel with potential customers and new leads. To help you customize your YouTube videos, I’ve created a YouTube thumbnail template for you to use. What can I do with this YouTube thumbnail template? This YouTube thumbnail template isn’t just for creating images for current videos. If you have older videos that you’ve uploaded to your YouTube channel, make sure you go back and create a YouTube thumbnail image for them as well. Most likely, they are ranking very well and you can continue to capitalize off of this by adding a more visual image to make your videos stand-out to others. For about the past two years, I have been steadily leveraging my YouTube channel to engage more with viewers and to broaden the reach of my videos. During this time, I’ve been keeping an eye on a number of changes that YouTube has been making – some of those incude the ability to create a custom YouTube background and the ability to monetize your YouTube videos. While these are great features that can help you better personalize your YouTube channel and bring in a little money for your hard work, one of my favorite features that they added is the ability to set a custom YouTube thumbnail image. Previously, if you wanted to choose a specific shot from your video to be used as a thumbnail, it could be done if you were a skilled video editor and followed these complicated instructions. For most YouTube users though, this was just too difficult to do and frankly, not worth your time. Enter custom YouTube thumbnail images! One of my favorite ways to engage with fans via social media is through my YouTube channel. Not only is YouTube the #2 search engine, but it’s also a great tool to promote and grow your online presence. For example, if you’re someone who creates a lot of videos about your products, YouTube is a great place to upload and store your content because not only are your videos available for people searching YouTube or Google, but they can also be embedded on websites or shared via your favorite social networks like Facebook, Twitter and Pinterest. While uploading your video content to YouTube is a must for anyone who wants to use video to engage better with their audience, one area that often gets overlooked when growing your online presence through YouTube is your YouTube background image. Although your YouTube background image is a static image that subscribers cannot click, it gives you the opportunity to get creative. 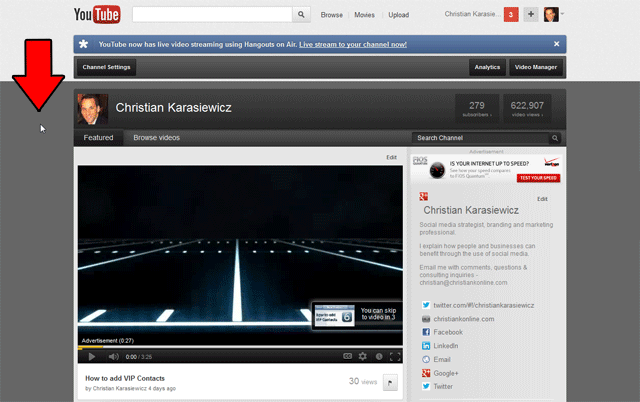 For example, you can brand your YouTube channel – simply by changing the colors. This space can also be used to let YouTube subscribers know that you’re also on other social networks or that you have a website. Today, Twitter announced a new feature – Twitter header images. What this means is that you can now make your Twitter profile more interactive. To help you out, I’ve created a downloadable Twitter header image template (PSD). For those of you who are looking to customize your new 2012 Facebook Page, I’ve put together a handful of Adobe Photoshop PSD files to help you customize your Facebook Page layout – and make the transition as smooth as possible. If you don’t have Adobe Photoshop or Adobe Elements, here are a 11 free Adobe Photoshop alternatives that you can use instead to get the job done. Also, feel free to work in stages, such as updating your Timeline cover photo and profile photo first (since these are the most viewed items on your Facebook Page).